The Beelink X2 is an inexpensive TV box/multimedia player based on Allwinner's H3 SoC. "X2" logo embossed on top cover of the device. Armbian fully supports Beelink X2 starting with version 5.15 (see the relevant thread for details and tweaks). Given the minor differences when comparing the fex files between several Orange Pis and Beelink X2 it should be relatively easy to provide OS images using mainline kernel later. Only one caveat: Like a few other H3 devices the X2 tends to overheat so unless THS stuff for H3 devices isn't ready in mainline kernel it's not recommended to use kernel 4.x due to missing throttling. The button on the bottom of the PCB triggers FEL mode (to be confirmed). It is reachable through a small hole in the bottom plastic cover. The X2 exposes H3's USB OTG port as a type A receptacle on the back next to the power socket which can be used with a male-to-male type A USB cable. This will also provide power to the X2. PCB revision 3.0 came with AP6181 WiFi which has been replaced by RTL8189ETV (as used on the older H3 Orange Pis, eg. Orange Pi Plus). Pin mapping remained the same so no need to modify fex or device tree contents, just a different driver is needed. The X2 UART runs at 3.3V levels, so you need a level converter (e.g. MAX3323) to connect the board to a regular serial port. Alternatively, a USB-to-UART adapter with 3.3V levels will also work. 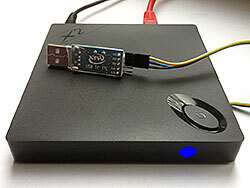 See the UART howto for details. The case is clipped together using plastic tabs on all four sides. Please see the Plastic tool howto for details of opening cases like these. The PCB is held in place by four small Philips-head screws. Make sure to remove the µSD card before taking out the PCB. The H3 chip is attached to an internal heat sink using a thermal pad. If you are unsure how to open the case, this disassembly video might also help. The UART (3.3V levels) is available on four solder holes (2mm spacing) next to the µSD slot. Soldering in a header will void the warranty. This page was last modified on 16 February 2018, at 15:09. This page has been accessed 39,150 times.